Light SAD Therapy for depression? Thanks to Light SAD Therapy research, we know of one more safe, inexpensive, rapid and effective treatment for depression – perhaps even your depression! If you suffer from seasonal affective disorder (winter blues) or even non-seasonal depression, this is some good news for you. 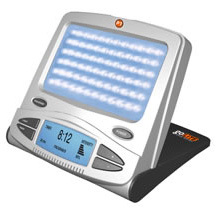 It is exciting to see that light therapy has become accepted in the Clinical Practice Guidelines issued by the U.S. Department of Health and Human Services. And it is spreading around the world into clinical practice. You owe it to yourself to ask your doctor about light Seasonal Affective Disorder therapy. 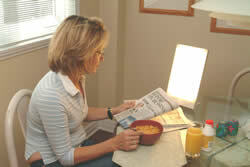 There you go; light therapy is easy to use, has no major side effects and is inexpensive! This is why you may be reading about this research more and more in your national paper. Not too long ago I was pleased to read in my own national paper, entitled, “A light in shining armour” that in Scandinavia, light boxes are in kindergarten classrooms! "Where can you look for a good light box?" "Where Do You Begin With Box Light Therapy?"